Have you given any thought to New Year’s breakfast? This smoked trout toast will cure any hangover, can be prepped the day before, and best of all, it’s really really good. To pickle the onions, combine a half a cup of apple cider vinegar and a cup of water then stir in a tablespoon of sugar and a half tablespoon of salt until dissolved. Mix in a teaspoon of whole or finely ground black pepper followed by a very thinly sliced red onion, cover with saran and refrigerate for at least an hour or up to two days. For the crème fraiche, scrape a half pint into a bowl and add a generous handful of finely chopped capers, a squeeze of fresh lemon juice, and coarse salt and ground pepper to taste. Refrigerate until a half hour before serving. 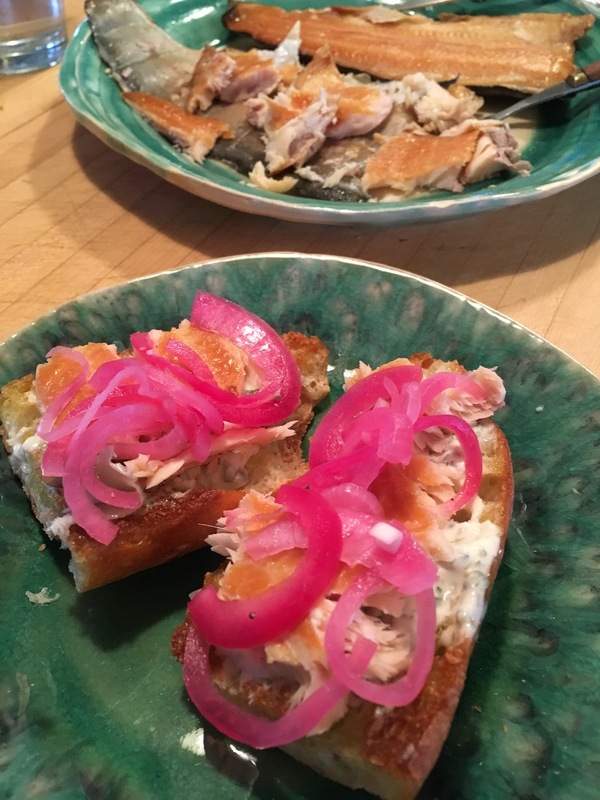 When you’re ready to go, grill a sliced baguette with a bit of oil in a hot pan, or toast some sliced bread, then simply layer the crème fraiche, smoked trout, and pickled onion on top.